Thank you to Cascade Yarns for providing the yarn for this sample! 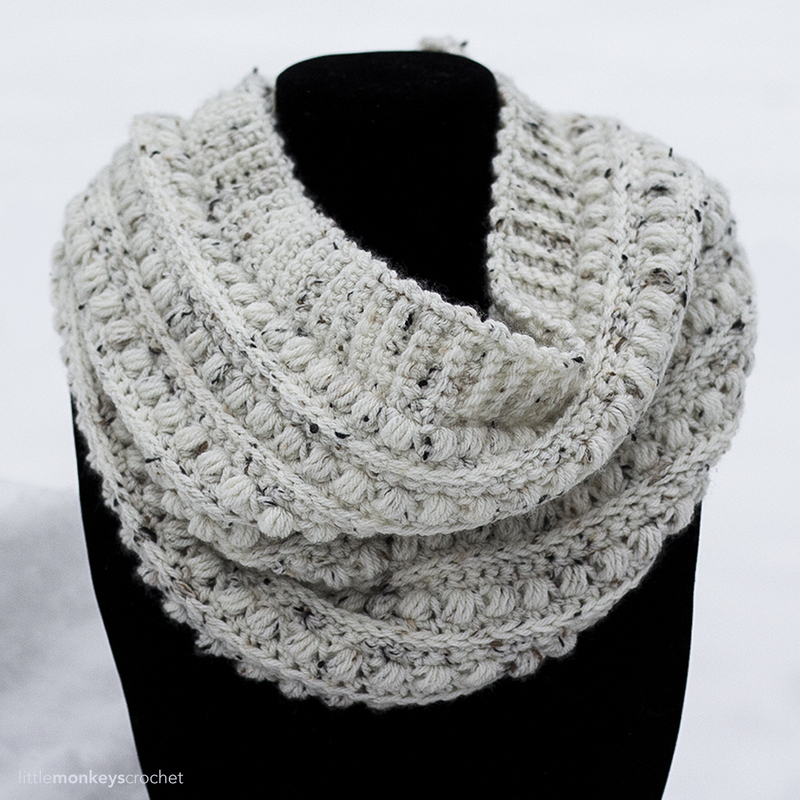 I recently discovered Cascade Yarn’s Longwood Sport when I used it to make the South Haven Slouch pattern last month. I really fell in love with it, and wanted to work with it again. As a newbie crocheter, I always avoided patterns with anything thinner than worsted weight yarn because I thought it would take forever to work up. 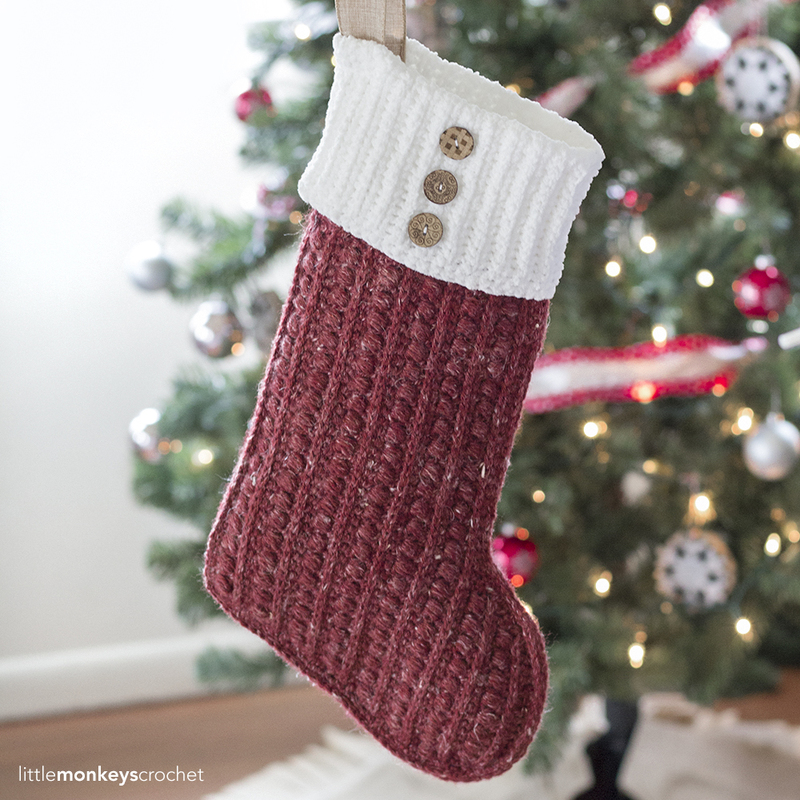 But eventually, I branched out and discovered that I actually love the look of items crocheted with thinner yarn. I encourage you to try it if you haven’t already! 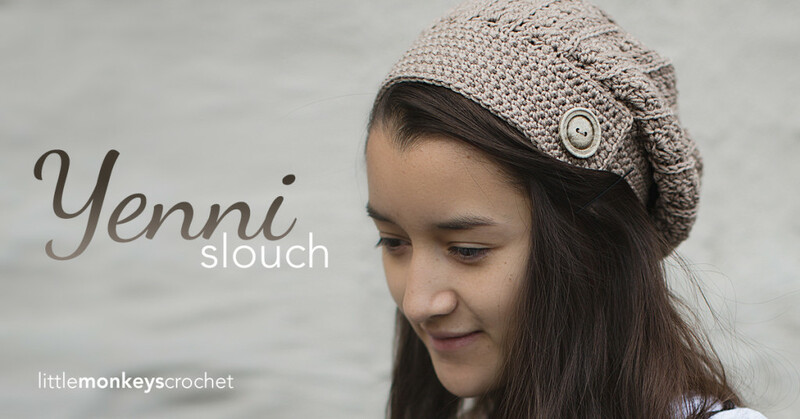 This slouchy hat, called the Yenni Slouch (that’s pronounced like the English “Jenny”, by the way) is named after my beautiful niece who is modeling it in the photo. 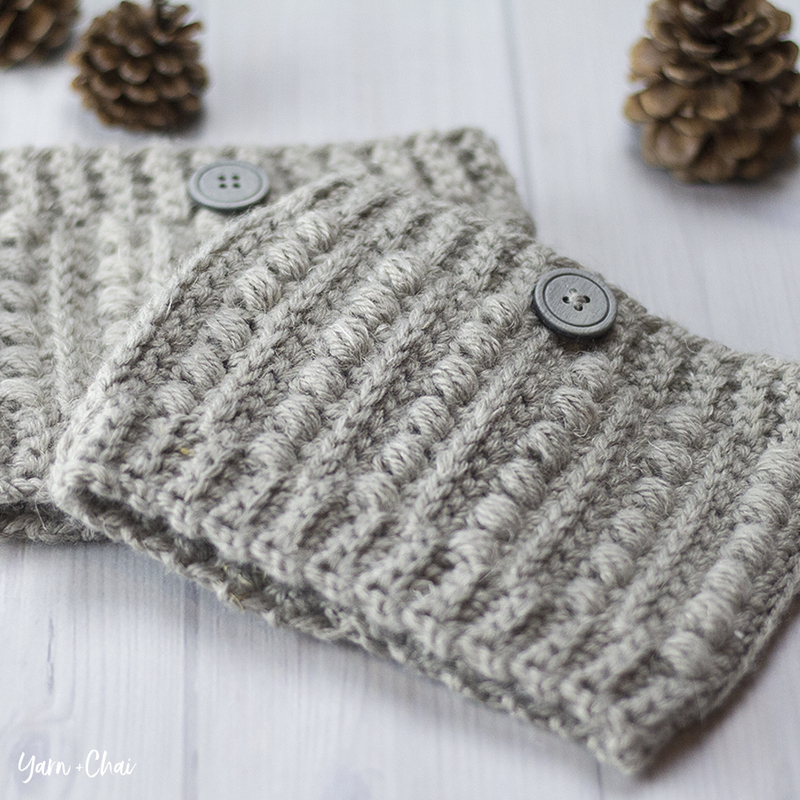 It also has a pair of matching boot cuffs — which, conveniently, are basically just little versions of the hat! Click here to purchase an inexpensive ad-free PDF version (includes both the boot cuffs and the slouch hat)! 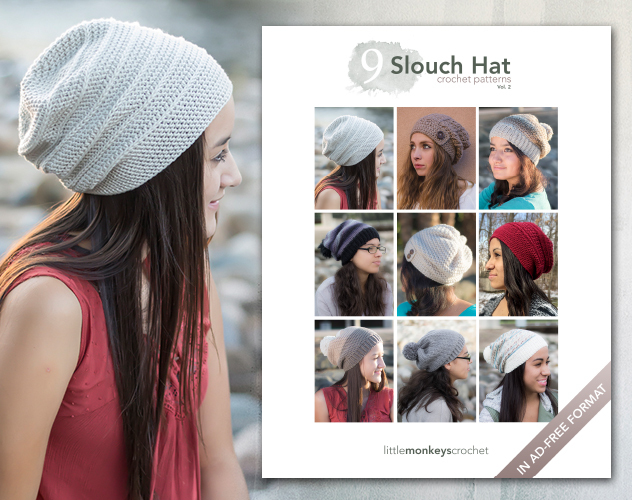 Click here to view the "9 Slouch Hat Crochet Patterns" E-Book! One Size Fist Most (Preteen - Adult Woman). Hat measures 10” across at band, and is 9” tall. Cascade Yarns Longwood Sport*, 250-270 yards. The color in the photos is Doeskin Heather. 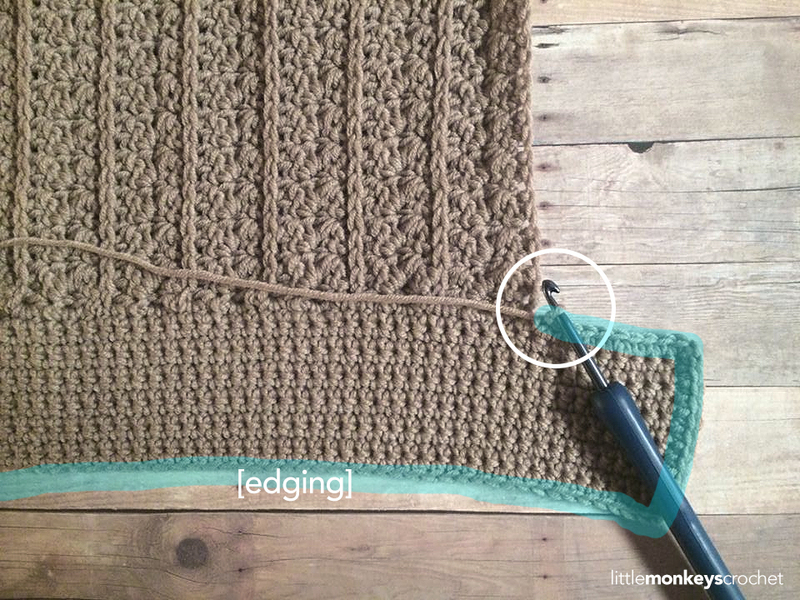 Gauge: With H hook, 4HDC = 1"
3rd Loop - Some rows call for the stitches to be completed in the "3rd loop". When working in turned rows, and after completing a row of HDC, these loops will be visible just below the front loop. So instead of inserting your hook into the top loops, you'll only insert it into that 3rd loop. 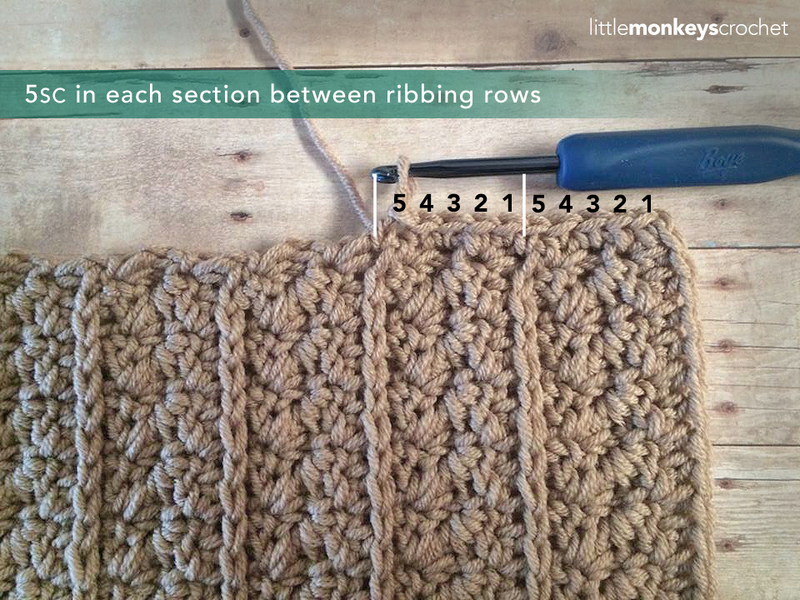 This will force the top loops to go to the front of your work, which is how we get the "ribbing" effect. Using H Hook, and leaving a 12" tail, CH29. Rows 6-72: Repeat Rows 2-5 in order until you have 72 total rows (you will end with a repeat of Row 4). Row 73: CH1, DO NOT turn. Begin to SC down the LONG edge of the project, putting 5SC in each section between ribbing rows (see photo below for a visual). You should end up with 90SC. Then, CH 11 to create the base of your button flap. Once you get to the top of the hat, make a knot and weave in the end. Turn your hat inside out. 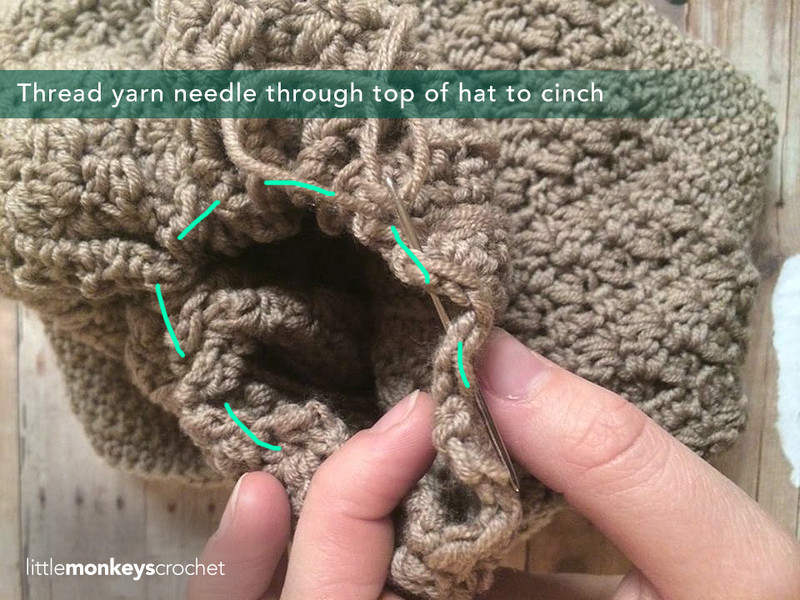 Use your starting tail to cinch the top of the hat by threading it through a yarn needle and weaving the needle in and out along the top edge of the hat at even intervals. Once you've gone all the way around, pull the tail tight and insert your yarn needle across the cinched area a few times to really keep it closed, then make a knot and weave in the end. Turn your hat right-side out again. We still need to sew our button flap in place and attach our button. Using a needle and appropriately-colored thread, position the button flap in place and sew along its 3 edges to secure it. Use your needle and thread to attach your button as well. Your designs just get better and better! Thank you for sharing your creativity. Beautiful pattern! You are so talented! Thank you for sharing your pattern! love this hat. really cute. A newbie and I love using lions brand heartland yarn and I love this yarn from hobby lobby. I have become addicted to your site. Your patterns are easy to follow and your pictures are so beautiful. I am a Little Monkeys groupie!! 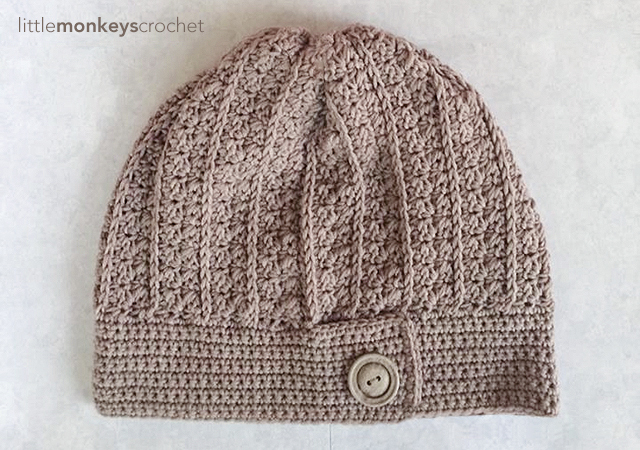 It would work fine with worsted yarn — since the hat is worked flat, you’d just need to adjust your stitches per row, as well as your final row count, to match the final measurements of the hat. 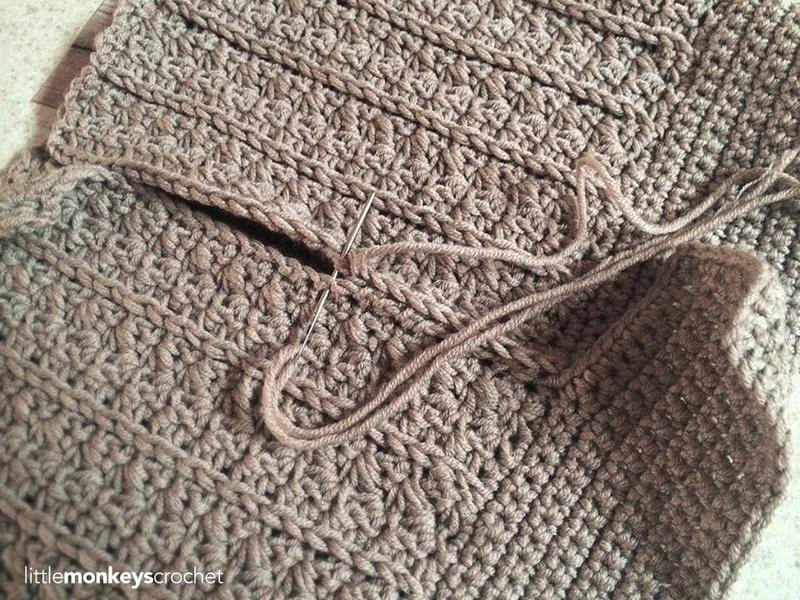 It’s not going to look as finely detailed as it will with the thinner yarn, but it will still have the general look. Love these patterns. Thanks for sharing. I love your patterns and . . . . this one is absolutely beautiful. I totally understand why it is your favorite! It complements your lovely niece spectacularly. Matching boot cuffs are superb. My daughter has already put her request in for this set. Thank you so very much for posting this pattern. I so appreciate your generosity. Your pattern designs are wonderful! I absolutely adore your patterns. Your directions are clear, concise, and easy to understand. I have been crocheting since my grandmother taught me when I was about 5 or 6. Now I am retired. I had never crocheted anything CAL until your Wildflower shoulder bag which I thoroughly enjoyed and while working on the first one of those my daughter, niece and granddaughter are wanting me to teach them to crochet. Now my most difficult task is getting each of them to stick to their decision as to which slouchy hat patterns they intend to us for their first project. Every time they settle on a pattern you come out with a new pattern and one of them decides on your latest pattern. I wanted to thank you for all the great choices you have given us and it may be summer before my begginers finish but after making 3 of the wildflower shoulder bags I know they will be thrilled with the finished product. Love the look, it makes me wanna run and get crocheting! And I love you have the cuffs,too. I love this pattern! I started with the H hook, but it was too “stiff”, so I used a J hook and finished this, but it has no slouch to it….it’s still beautiful, but I think the pattern needs to be a bit longer than the beginning 29 chains. or maybe my yarn was too heavy. Thank you for sharing this beautiful pattern! It’s probably the yarn. What are you using? I used, I love this Wool, super soft. It’s still a beautiful pattern, and thank you again for sharing it. I will be using it a lot as i’ve gotten so many wonderful comments on it. Another great pattern. I’m making some chemo hats and this looks a lovely design, thinking of using Berroco’s nylon/acrylic comfort dk on 3.75mm & 4mm hooks to size. Thanks. This is extremely cute!! I’ve already started making it. Thanks for posting it. Your blog is very nice also. I like this pattern and agree with you about your niece being beautiful. I’d be taking pictures all the time! Is that, by any chance, a matching cowl in the introductory picture of you? Is the pattern available? Could you send it to me? I just discovered you because of a link on allfreecrochet. Welcome, Shirley! Wow, you have a sharp eye. 🙂 That is indeed a matching pattern (it’s an infinity scarf). Unfortunately the pattern is not yet released, but it will be soon! I love this pattern! I was wondering if you happen to have matching gloves to go with it. I’m making the hat and scarf as a gift and would love to use this stitch/pattern base for matching gloves too. Hello……i love all your work thanks for sharing. Im interested in the yenni hat i was tryning to order the yarn…so i wanted to know will the heartland yarn be okay….thankyou…..i love all your patterns. ..
Hi there! I was wondering if you knew any tweaks to the pattern if I wanted to use a yarn that was weight #4 and medium to have it turn out right? Sure! It’s pretty simple since this pattern is worked flat. I would choose an H or I hook. You just want your starting chain (keep it an odd number) to be about 7-7.5″ (slightly stretched), and you’ll do your row repeats until you get to about 21″. Then you’ll do the band of the hat as written. It should come out ok! I made this lovely hat for my daughter for Christmas. The pattern was a joy to follow, so well written, and the hat is beautiful!!! Thank you for this incredible pattern!!! I can’t wait to make this hat! I know just who I’ll gift it to when I do! I much prefer headbands and ear warmers but I love this design. It has character and the knit look stitches are cool! 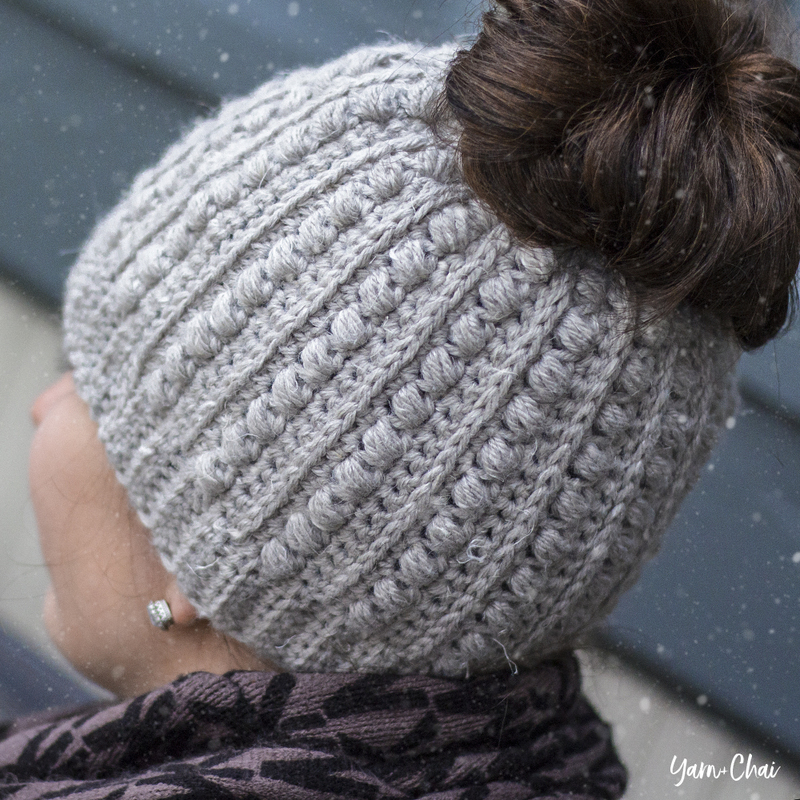 I LOVE this hat and can’t wait to find the yarn! I made this set for my Aunt for Christmas ? She absolutely loved it!! Thanks for the wonderful patterns! Great looking hat with fun pattern. I made this hat and the matching boot cuffs for my granddaughter and the pattern worked up so nicely! It turned out great and granddaughter loves the . I live in Australia and it is impossible to purchase a 4.25 hook – I have spent days searching to no avail. I love your hat and wonder if I can still make it even though I don’t have the right hook. I’m sure I could work something out if I was proficient but I am still a beginner at crochet. Can you help please? Thank you for sharing! I’ve made some beautiful hats for my sisters with this! It’s beautyful I will try to do it for my grand dauther. She look a lot like the beauty on this page. Tank you very much. It more than 20 years that i din’t crochet. you give mIt a good pass time. How did you end up with 90 SC total 5SC in between the ribs. I end up with 14 ribs only which gives me a total of 75SC. I don’t know where are the rest to total to your 90. Please help! You should have 17 ribs, creating 18 sections. 18×5=90. I really like the look of this pattern and have a Deborah nor vile everyday soft worsted yarn I’ve been planning on using for this type of pattern. Will this work. I can never seem to find a smaller weight yarn that’s not too expensive? Hello, I am new to crochet and I am giving your lovely pattern a go. I have used chunky wool and using a 6mm hook. I have done about 20 rows now and it’s just coming out at 9″ long I thought it would be longer as I’m using bigger wool and hooks to your pattern or have I got this wrong? Also on row 4 do you put an extra 2hdc every time you get round to doing this row again. I hope you can help. Yes, you’ll follow the instructions exactly as written, including the 2hdc. (Make sure you are also skipping the first ST of the row to account for it.) Regarding the length, are you referring to the tallness of the hat? The hat ends up being 9″ tall if you have the correct gauge, so if you’re using a larger yarn and larger hook, then the fact that it’s already 9″ without adding the band at the end (which adds a couple of inches) sounds about right. Thank you Rebecca, just worried I will do all 72 rows and get to the end to find it fits a small child than fit myself. Without the band it’s currently about 9inches tall. I am wondering if I should start again before I go any further but make my starting chain longer. I think it just comes down to how slouchy you like your slouch hats. The one in the photo is 9″ tall. could you please tell me the number of inches long the 72 rows turned out to be? I can’t tell you exactly, but based on the final measurements of the hat it was probably about 10-10.5″ long. No sorry, I do not mean the height of the hat, I mean the length of the 72 rows! (which would be way longer than 10″) …is there any way you could remember or get the length (before joining/gathering)? thanks!! Sorry! Just saw the explanation further down. Hi Rebecca, first thank you for all the beautiful patterns. I look forward to all of the fun. ? I have read through all the comments a few times and have learned how to work the new stitch ( hdc 3rd lp ) but I’m very confused on this one. Am I doing a row of hdc 3rd lp across or sc+dc in 3rd lp, skp 1 st across or 1hdc 3rd lp, skp 1 st, sc+dc, skp 1st across? Yes I said I was confused lol. This really means alot to me, I am making this beautiful hat for my daughter that is preparing to join the Navy. Knowing we probably won’t be seeing one another much through her journey. God bless you. Again Thank you. Are you referring to Row 5? “Working in 3rd loops, (SK next ST, SC+DC in next ST) across” just means that you’re doing your (SK, SC+DC) in the 3rd loops of the previous row’s stitches instead of the top loops like you would normally do. So, the second option you mentioned is the correct one. Do you think that if I used a smaller crochet hook and crocheted a little tighter that I could scale this down enough to fit a 6 year old child? I just love the look and I know my granddaughter would too! If you do it that way, you’ll end up with a stiffer fabric that might not slouch properly, and you’d really be guessing on what your final measurements would be. A better way to do it would be to look up the standard measurements of a child’s slouch hat and adjust your starting chain and row count accordingly (i.e. measure as you go). Since this hat is worked flat, it wouldn’t be as complicated as it would be if we were working in the round. Do you have a youtube tutorial on this? Question: What do you do if you are not a rank beginner crochet person but a advanced pattern will result in your ball of yarn being thrown across the living room? Answer: Make one of your hats!! Perfect blend for an in-between ability person like me. Easy to follow directions. WOW! I am so proud of myself! Thank you for the pattern. I’m half done and can’t wait to finish. It is much better than crocheting cotton dishrags forever! WOW! Thank you for a beautiful, well written pattern. I love it. Thanks for the fab pattern! I’ve already made the rustic version with #5 yarn. I started the Yenni today with #3 and it wasn’t looking like it would be slouchy enough. So I’ve started over with a starting ch of 35. I think it’s going to be just right! Hi I have been following the pattern then realised I have been repeating rows 1-5 not 2-5. I have pulled it back to row 5 and started again but now I have the first rib on the opposite side to the rest. I can’t see a solution because the first set is 5 rows and the rest are sets of four. Thanks. So I’m not sure what it is that you’re doing, but mathematically, the pattern works. You have to have either added or missed a row at some point to throw the pattern off. Hope that helps! I want to make the slouch longer. Do I just take any even number and add 1 to it? No matter how many times I try this hat the count does not come out to 28. I get to row #3 and it’s off. Tried many times. I give up.